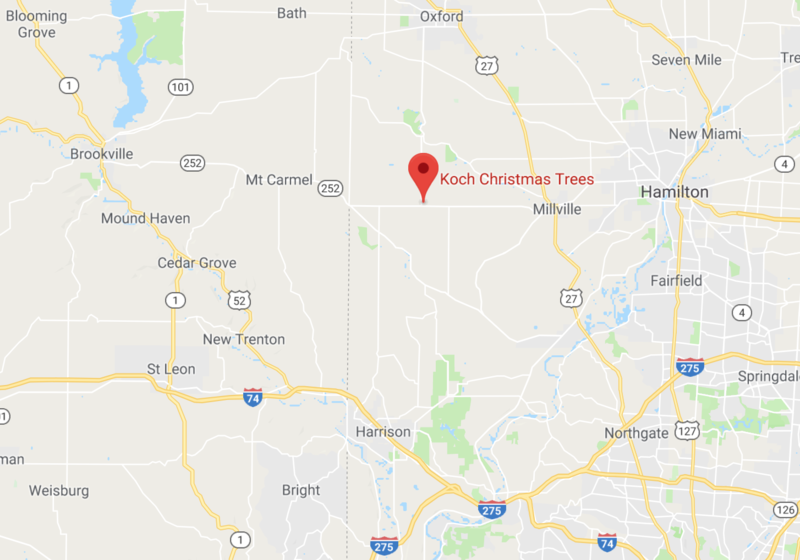 The Koch Christmas Trees farm is in Butler County, Ohio, just north of Cincinnati. We are in rural and picturesque Reily Township, which is the central and western part of Butler County, about 4 miles from the Indiana state line. Our Farm’s address is 6232 Hamilton-Scipio Road, Okeana, Ohio, 45053. Because our farm is located on a zip code boundary, if you are using a GPS to locate us, you may need to change the zip code to 45056 (Oxford) or 45013 (Hamilton). Take Route 27, Colerain Avenue, north into Butler County through Ross and to Millville. At the first light in Millville go west on Ohio Route 129 approximately 8 miles to the farm, which is on the corner of Route 129 and Route 732. Go through Millville on Route 129. The farm is 8 miles past Millville on the right, which is on the corner of Route 129 and Route 732. Take Route 732 south until it dead ends at Route 129. This is about 3 miles south of Reily. The farm is on the left.